Moon bears have shaggy black fur with a distinctive yellow crescent across the chest and large elongated ears. Highly intelligent, they have an extensive vocabulary of sounds. Moon bears are affected by human exploitation in bear farms. Bear bile is a traditional ingredient in Asian medicine and is extracted from living moon bears. Caught from the wild with vicious traps, the bears are kept in cramped cages – their teeth and claws removed. It is estimated that there are more than 10,000 moon bears held in farms in horrific conditions in China and Vietnam. 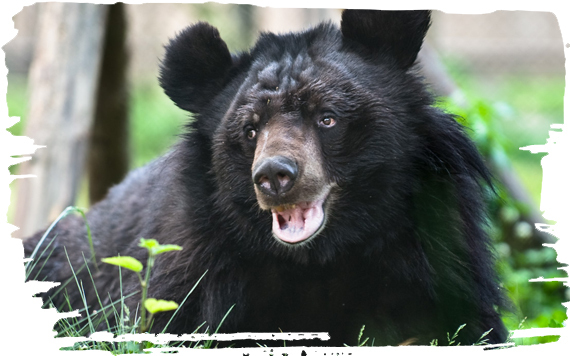 Funds from your adoption will support the lifetime care for rescued bears at Animals Asia's sanctuary in Vietnam. You will also be helping support Animals Asia's campaign to end the cruel practice of bear farming and also in their mission to rescue hundreds of bears in China. You can help care for these bears by adopting Bodo below. 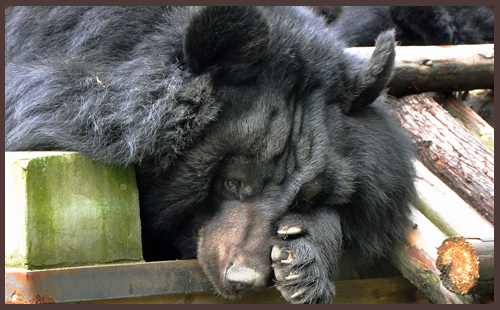 Bodo was rescued from a cruel bear farm where bears are ‘milked’ for bile, used in Asian medicine. Thankfully, Bodo was too young to be 'milked'. When he was rescued, he was missing his right front paw. Help us provide the care Bodo needs.